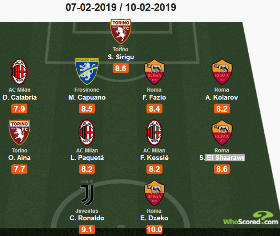 Ola Aina has been recognized for his outstanding performance this past weekend for Torino after he was included in Whoscored.com's Serie A Team of the Week. The Nigeria international's 31st minute header, his first goal in Torino's colours, secured all three points for the Maroons in a match day 23 fixture against William Troost-Ekong's Udinese at Stadio Olimpico Grande Torino. In a 4-4-2 formation, Aina was deployed in the right side of midfield, with Roma's Stephan El Shaarawy occupying the left side.